I’ve been interested in healthy living since I was a young teenager. In fact, that no doubt played a role in my decision to attend R.N. school. I’ll admit, however, that possessing knowledge about a topic doesn’t necessarily mean one always lives it. I’ll be perfectly honest…I don’t get enough sleep and I don’t exercise enough. But I’m working on it. Maybe we can encourage one another! Take a look at these healthy living resources I collected and then let’s chat about it in the comments. Or email me, if you prefer. I’ll bet I’m not the only one who could do a better job living a healthy lifestyle. C25K, is a fantastic program that’s been designed to get just about anyone from the couch to running 5 kilometers or 30 minutes in just 9 weeks. Dieting is hard enough. But when you work hard, hop on the scale, and see a number that’s higher than yesterday? Well, that’s just not fair! Happy Scale smooths out your daily scale weights so you can get insightful predictions about your weight loss rate, when you’ll hit your goals. Start your day with an energizing hip-hop run, squeeze in a quick classic rock core strengthening class post-lunch, unwind with a soulful vinyasa flow in the comfort of your living room. I bought my Fitbit in January of 2016 and I love it! I chose the clip on version because I didn’t want to wear something on my wrist all the time. He doesn’t mind wearing it on his wrist and in fact, loves the fact that he can see who is calling him, as well as tracking his steps and sleep. If you haven’t seen it already, you might also be interested in my post, Beginner’s Guide to Meditation. Healthy living involves the mind, as much as the body. 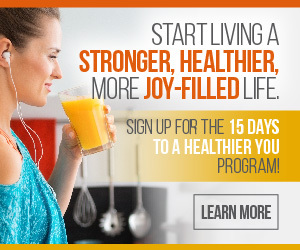 I also highly recommend Crystal Paine’s course, 15 Days to a Healthier You. It is currently sold out but you can sign up to receive notification when it is available again. Finally, Amazon offers numerous fitness video options. You can purchase DVDs or, if you are an Amazon Prime member you have access to a huge number of fitness videos included in your membership on Amazon Videos. I do just fine with getting enough sleep. I need to improve a lot when it comes to exercise though, and could do with making a few improvements when it comes to my diet as well (people always assume vegetarian means healthy, but it really doesn’t always, and I’m far too quick to grab for the less healthy meal options). I really need to figure out how to get more and better quality sleep. As for the vegetarian thing, I know some very healthy ones and others whose diet is no better than the typical person; they just skip meat. I think there are many ways to have a healthy diet and it’s very individual. I like Michael Pollan’s recommendation – eat food, not too much, mostly plants. I agree that getting enough sleep is really important. Thanks for sharing this awesome article!